If you are looking to indulge in a relaxing, luxurious boutique hotel experience, look no further than the French Quarter Inn in Charleston, SC. From the moment we walked in the door, hotel staff went above and beyond to make our stay a true pleasure in every way. 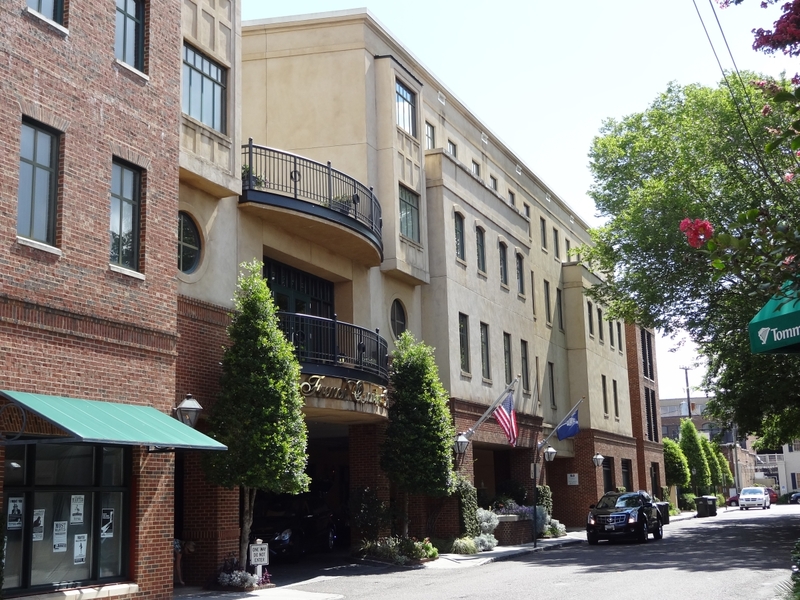 The hotel is conveniently located a few steps from Charleston’s most popular tourist attractions, yet is quiet and secluded. We were celebrating our 20th anniversary and decided to spring for the Luxury King Balcony Suite. The spacious bedroom included a king-size bed with premium bedding, an armoire, desk, clock radio/docking station, mini-fridge, and in-room safe—not to mention, an incredible view. We had access to high-speed internet both in our room and in the hotel common areas. Each time we returned to our room after it had been serviced by housekeeping, soft music was playing. Turn-down service was provided as well—complete with a chocolate treat! We had a full living room with a fireplace (a little warm for June, but aesthetically pleasing, nonetheless), flat screen TV, and private balcony access. The sofa included a pullout bed, and there was a blu-ray DVD player. The large bathroom was fully stocked with plenty of fluffy towels, luxury spa products, waffle weave robes, and even a super fancy toilet paper receptacle! I spent quite a lot of time sitting on our balcony. We were on the third floor overlooking a quiet street and a picturesque garden with beautiful wrought-iron gates and charming statuary. A continental breakfast was served daily in an area adjacent to the hotel lobby. Selections included fresh fruit, pastries, cereal, boiled eggs, coffee, milk, a variety of juices, and more. We ate there several times and enjoyed the gorgeous weather each morning in the outdoor terrace dining area. There is an evening wine and cheese reception, and freshly baked cookies and milk are offered each evening in the lobby area. 24-hour coffee service is provided, as well as all-day availability of flavored iced teas and snacks. The concierge arranged for our transportation to and from the airport and we never entered or left the hotel without a doorman opening the door for us and inquiring after our needs and comfort. We decided to extend our stay by one day, but our suite was not available so we were moved to a Traditional King Room. Honestly, the only difference was size! Though smaller than the suite, the traditional room was roomy and every bit as comfortable and commodious! We were 100% pleased with our stay at the French Quarter Inn and can’t wait to return on our next visit to Charleston!